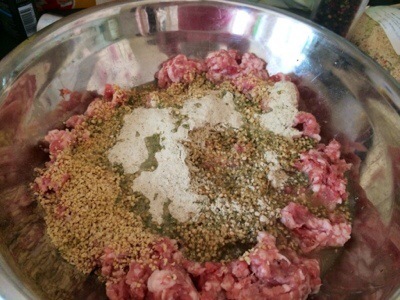 That time where I just have to make sausages.. I find it’s an excellent way of relaxing. Strange to some yet good for me , I get to think through work stuff as well as home stuff .. All kinds of stuff and all whilst stuffing sausages! 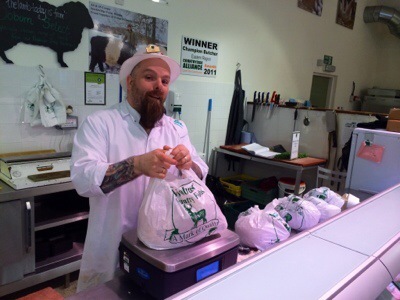 Went to see my pal butcher Dave, he had some delights for me .. A few kilos of pork trim. A couple kilos of venison trim ( to be turned into venison burgers today.. ) a couple of kilos of lamb trim.. For kebab and a couple of kilos of beef trim.. For beef sausages.. So laden with meats from happy beasts.. I set myself up to make strings of happiness..
First sausage meat in made was old dubliner style .. 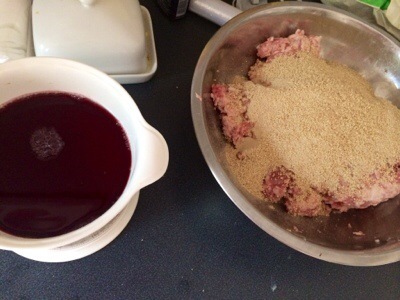 This was then used to make sausage rolls for one of Mrs Fitz’s friends who asked for them for a party.. 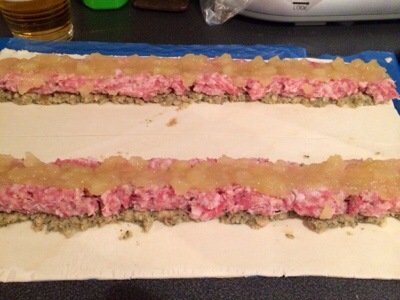 So knocked some up with sage and onion stuffing and Bramley apple sauce.. 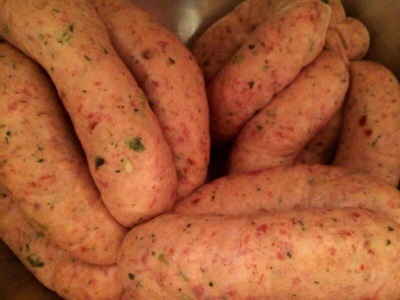 I reckon they will dig them..
And sausages type one.. Welsh dragon .. So called because of the leek and chilli mix.. Plus other spices.. They look good stuffed into their hog casings.. And smell pretty darn find too! Next? 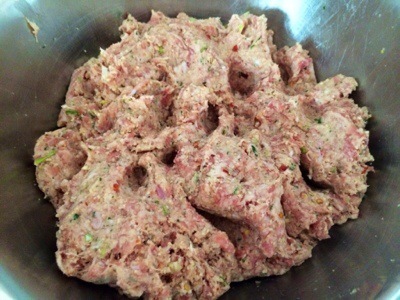 Toulouse sausage .. That wonderful frenchie job . The smells of this are so evocative .. Plus the addition if good redwine.. reckon these are going to be stunning.. Again stuffed into hog casings..
Sausage making really is simple Simons.. You have to try it.. You get to control all the levels of salt fat and flavours..
Plus you get to think about stuff..
Gorgeous sausages! And your rolls look delicious! These do look amazing. I love the flavor combinations you used… And those rolls sounds fabulous. Like Patty, I’m experiencing some serious cravings now… Thanks for bringing these to the party! Then this is the perfect thing for you! Butcher Dave looks cool. Almost as cool as my Fishmongers Dave, Nate and Jim. The sausage rolls are drool worthy. I never thought to put them in a roll. Will have to get right on this thing. Chinese huh? Was anyone still up? Thanks! No one was up for the Chinese.. So I ate it in the virtual dark .. It is and was! Thanks! Yeah v good .. Thanks! These look great! I love the final pic and your presentation! They are and were! Thanks for stopping by! Hey Mr. Fitz! Thanks so much for bringing this array of sausages and sausage rolls to FF#10! 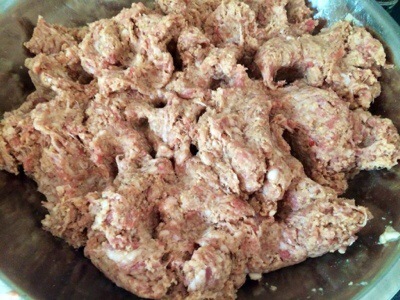 Like my lovely co-host, Hilda, I have never tried to make my own sausages, but I know that they are so much more healthy and tasty than the average store-bought ones. Your descriptions inspire me to take a course on this, or at the very least, search out a local shop that sells what you are offering us here tonight! I hope you enjoy the party tonight…can I offer you a drink? You really should try making your own.. its far easier than you think.. and thanks to the web gods everything is available to get.. try a small hand crank machine first.. shouldn’t be more than 30 bucks..no need for a course.. just make mistakes and fail forwards! .. a drink.. nah.. still at work.. off to the pub soon.. will get a carry out so I can join the party later! Great! Come on by – We’ll be partying till the wee hours! It is! and very satisfying! 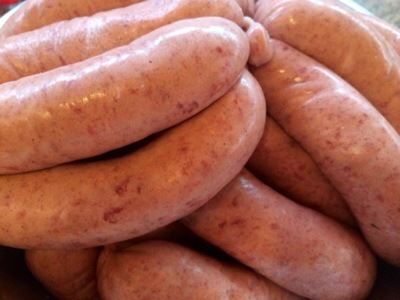 I have often thought of making my own sausages, because as you say that way you get to control what goes in them, and home-made ones are so good. I have been a little shy to try because it seems difficult, and you must need some fancy equipment. 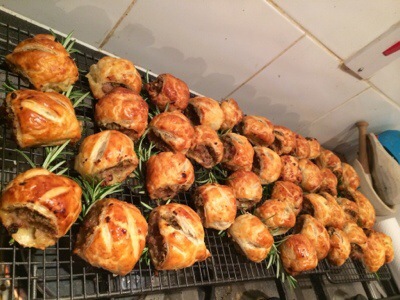 But no reason I can’t make those delicious sausage rolls – and maybe build up the courage to tackle a real sausage. Thanks for the encouragement and ideas. You really should try it.. it really aint tough to do.. and the wonderful web will provide you with low-cost hand cranking machines.. for not much cash.. then you can end up like me where you start reading industrial catalogs! Wow. That is quite a daunting prospect – the industrial catalogs that is. However, it would be a great way to showcase some foraged plants, and wild game too. So maybe I will get onto it. You really should try.. And perfect for wild game..